Award winning design captures 2008 National Ergonomics Conference Attendees choice Award for best new product. Stops pain and prevents pain. Useful for both laptop and desktop computer applications. Eliminates reaching for a traditional mouse, relieving neck, shoulder and elbow pain. Asymmetrical reaching with one side of your body and not the other causes your muscle groups to compensate for the weight of your extended arm while reaching for a traditional mouse. Repetitive reaching oftentimes leads to tightness and pain in the neck, shoulder and elbow areas. The RollerMouse Free allows you to keep your elbows comfortably by your side, which is a more beneficial ergonomic position. Thousands of users have thanked us due to the pain relief they have realized after using the RollerMouse for a short period of time. Please review the testimonials linked to this page for their direct feedback. There is no gripping necessary, thus avoiding the threat of Repetitive Strain Injuries such as Carpal Tunnel Syndrome and Tendonitis. The RollerMouse Free is controlled with the use of an unflexed hand, so there is no need to clutch or hold the device in order to navigate the cursor. Your fingertips roll a narrow bar both up and down and from side to side simultaneously to navigate the cursor over the entire screen, with very little friction or resistance. The elimination of flexing your fingers avoids activity through the carpal tunnel, overuse of a traditional mouse can aggravate the carpal tunnel and lead to numbness, tingling and pain. Promotes the equal use of both hands, reducing the risk of injuring your dominant “mousing” hand. With the mouse buttons centered beneath the keyboard home keys, mouse control is equidistant from either hand. Ambidextrous use is encouraged and easily accomplished with your command buttons literally at your fingertips, for both hands. Useful for both laptop and desktop computer applications. The RollerMouse Free has been designed to fit immediately adjacent to your keyboard or laptop. This places the mousing controls just a few inches below the home keys, keeping your hands within a small work area, eliminating large reaching motions. Convenient, out of the box, “plug and play” connectivity for both PC and Mac computers. This HID compliant device has the drivers “on board” and simply needs to be plugged into any empty USB port, without the need for a cumbersome connection routine. Seven powerful button functions right out of the box. There are two easy options to perform a “left click.” Either push down on the navigation bar itself, or click on the large left button in the button control area. Other button functions include a traditional “right click” button, a single touch “double click” button, a scroll wheel, a scroll lock , “one touch” copy and “one touch” paste (On Macs, the top two buttons are Volume Up and Down rather than Copy and Paste). For a visual demonstration, please activate the “watch video” button on this web page. 30 DAY, NO RISK, PRODUCT REFUND if you are not satisfied. You won’t appreciate this product’s ease of use and responsiveness until you try it out for yourself. Please view the product video on this page for the initial reactions of some first time users, so you can rely on an objective opinion and not our view of this beneficial product. If you are dissatisfied with your purchase in the first 30 days for any reason, simply ship it back to us for a refund. 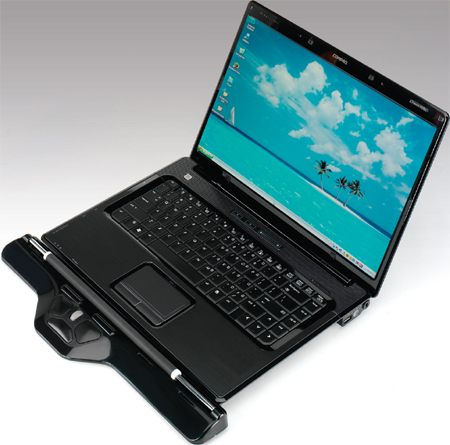 The RollerMouse Free has been designed to fit immediately adjacent to your keyboard or laptop. This places the mousing controls just a few inches below the home keys, keeping your hands within a small work area, eliminating large reaching motions. This central pointing device eliminates the need for a traditional mouse. You control your cursor by rolling a "dowel" control bar with your fingertips with very little effort, both up and down and side to side simultaneously. Easy to Remove palm supports allow you to adjust your RollerMouse Free to your specific comfort preference and potential space constraints. Free2 has 15" of unrestricted bar access. The other main differences are no keyboard tray and Free2 is much thinner. The length of the Free2 is a bit shorter than the Pro2. 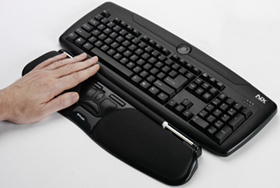 Free2 has 15" x 3.5" measurements including the wrist rests and Pro2 has 20" x 3.5" measurements. 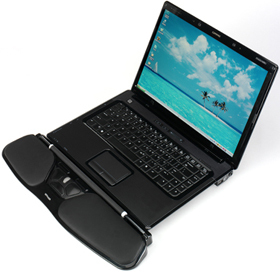 Overall the Free2 tends to fit in better in most smaller workspaces especially since the wrist rest can be removed.